To determine fluid specific gravity, add 0.1 to float specific gravity clean liquids and 0.3 to float in specific gravity in dirty or viscous liquids. The LVK-120 Series OMEGA Starter Kit can be assembled and installed vertically in your tank in minutes. 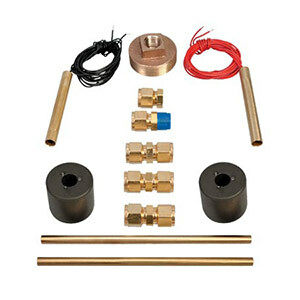 Each kit contains all the components for complete assembly of a 1 or 2 station level switch for pipe-plug mounting. Additional level stations may be added. (See accessories). Max. Assembly Length: 76.2 cm (30"), approx.